It is always an exciting time when our K-9 selection team gets to travel to Indiana to purchase a new K-9 for the Douglas County Sheriff’s Office. 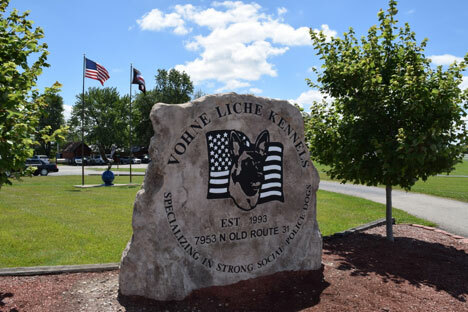 As stated in my previous blog, we work with Vohne Liche Kennels to produce a short-list of available dogs for our review. Here’s how the evaluation process works. Once we get the K-9 list narrowed down with our specific requirements, we conduct a variety of standard tests for each of the dogs. The first test we do is an environmental one where we bring the dogs to a variety of locations to see how they react to slick floors, dark and bright areas, dirt, grass, open and solid stairs and obstacles. The reason for this? Not every dog has come across these environmental conditions, and often times we lose dogs in our process due to the fact that they cannot function in some of these environments. We will hide a person (a decoy) in a building with a variety of rooms and preferably two levels that the dog can access. The decoy will sit for awhile to get their odor pooling in a room. We will then have the decoy come just outside the door and let the dog see them from about 20 yards away. The decoy then goes back inside to the original room they were hiding in and then we walk up to the door the dog saw the decoy go in and send the dog into the room. Once the dog goes inside nothing is said by the handler, decoy, or instructor until the dog engages the decoy. This gives everyone the opportunity to observe the dog using its natural ability to hunt for its prey, which includes using its nose, ears and eyes. If possible, this is done in low light conditions to force the dog to hunt through its sense of smell. This test also gives us the opportunity to see how long the dog will continue to hunt before it either gives up, comes to one of us for direction, or maybe out of frustration bites one of us. We also want to see how the dog engages the decoy and how the K-9 releases its bite. Some dogs may not engage a subject who is not viewed as a threat to it due to just standing in a corner. Other dogs are familiar with a suit and will go right in and once they find the decoy engage in a bite. If a dog is unsure, the decoy will make a move to get the dog to safely engage with them. This test shows us if a dog is willing to bite a decoy, if it will stay on the bite when being swung around or touched on its body, or if it is not willing to bite due to fear or the environment. Once the dog is biting the decoy we will physically get control of the dog and lift it off the decoy as most of these dogs do not have a release command. This evaluation is also important as it shows if the dog releases the bite as soon as the handler comes near it or touches it. The dog may let go and bite the handler for getting close to “its prey”, or the dog may bite harder as the handler starts to remove him from the bite. Our team will run a tracking test by setting some small tracks to see what the dog’s natural ability is in this area. It’s important to also safely test a dog’s reaction to a threat–in this case an advancing decoy in a bite sleeve. Some dogs will advance on the “threat,”, others will wait, and some dogs will turn and run. The latter would be a point of concern for us and we would be looking for the two former behaviors in an exemplary dog. At this point we are usually pretty confident on which dog we will choose. We will then confer to make sure we all agree and then fly home with our newest team member!